ANNIVERSARY OF ANIAKCHAK 1931 ERUPTION! On this day in 1931, Aniakchak Caldera, a large explosive volcano on the Alaska Peninsula, began a violent, 6 week long eruption that dusted a large area of southwest Alaska with gritty volcanic ash. 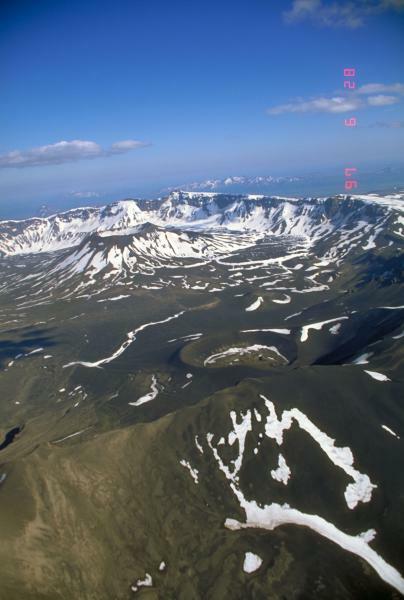 Since the 1931 eruption, Aniakchak has been quiet, but ongoing earthquake activity detected by the Alaska Volano Observatory and measurements of magmatic gas from bubbling springs mean the volcano is still potentially active. The Caldera is located in Aniakchak National Park and Preserve and it is a beautiful, wild place. The 1931 eruption was witnessed by many residents and artfully recorded by Father Bernard Hubbard, the Glacier Priest, of the University of Santa Clara. The first sign of activity in 1931 was noted on May 1, when residents of Meshik (now part of Port Heiden) saw a vigorous, white column of steam ascending above the crater. By noon, residents reported ground shaking, rumbling noises, and fallout from a large, black mushroom cloud, intermittently illuminated by lightning, over the caldera. Radio communications with Chignik and other communities in southwestern Alaska were hampered repeatedly by static caused by ash in the atmosphere. Observers describe a constant level of eruption until May 11, when an extremely violent explosion rocked the volcano. Heavy ash fall produced total darkness for several hours near the volcano. As much as several millimeters (1/8 of an inch) of black ash accumulated at Chignik, and greater amounts were recorded at Ugashik. Rafts of pumice containing fragments as much as 20 cm (8 inches) across were floating in Bristol Bay west of Meshik. After May 11, the eruption diminished in intensity until May 20, when explosions were heard at Ugashik and points further from the volcano. On May 26, small ash plumes rose over the caldera and Chignik residents reported rumbling in the direction of Aniakchak. Several earthquakes, some described as severe, were felt in Chignik and Hook Bay in late May. Father Hubbard flew over the volcano on June 10, while the eruption was still in progress. His party first hiked to the caldera on June 13 and discovered still-moving, blocky lava flows at the bottom of two new explosion pits. The inside of the dramatic caldera was covered in ash and what had been lush vegetative cover was now a dull gray moonscape. Reindeer and caribou losses from fallout were reported to be 'heavy' at Nushagak, and dead swans and geese, believed to have died from ash ingestion, were noted at Ugashik. Read more about Aniakchak here.